BAE Systems has been awarded a contract to supply 30 Assault Amphibious Vehicles. The Japanese Ministry of Defense has awarded BAE Systems a contract to produce 30 Assault Amphibious Vehicles (AAV) 7 for the Japanese Ground Self-Defense Force (JGSDF), according to a April 7 BAE Systems press release. The defense contractor will provide “30 new AAV7A1 Reliability, Availability, and Maintainability/Rebuild to Standard (RAM/RS) vehicles, plus supply tools and test equipment to support maintenance,” the press release states. In addition, BAE Systems will offer training aids for the vehicles to the JGSDF. 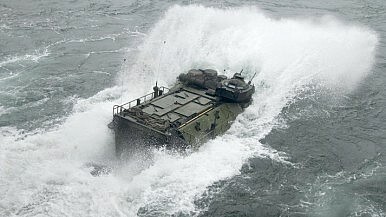 The armored AAV-7, launched from amphibious dock landing ships, is designed for assaults on shorelines and can transport both naval infantry (up to 24 marines) and cargo. The AAV-7 is armed with a M2HB .50 caliber heavy machine gun, and a Mk19 40 millimeter automatic grenade launcher. The JGSDF variant of the AAV-7 “provides a more powerful engine and drive train, as well as an upgraded suspension system, allowing the new vehicles to meet or exceed original AAV7A1 performance,” the press release details. The new assault amphibious vehicles will be built at a BAE facility in the United States. Production is slated to begin this August with the final vehicles expected to be delivered to Japan by the end of 2017. As I reported previously (See: “Japan Approves Record Defense Budget”), Japan’s fiscal year 2016/2017 defense budget includes funds for 11 units of AAV-7. The money for the additional AAV-7s will be included in subsequent defense budgets. (Overall, Japan plans to acquire 52 AAV-7 by the end of 2018.) The Japanese ministry of defense has been working on introducing more long-term defense contracts and bulk orders in order to save costs. The Japanese military is setting up an Amphibious Rapid Deployment Brigade by the spring 2017. “The initial size of the brigade will be around 2,000 troops, but this is slated to increase to 3,000 once the force becomes fully operational sometime in 2018. The new brigade’s principal mission will be to defend the 6,000 islands and islets of the Ryukyu Islands chain, which stretches southwest from Kyushu to Taiwan,” I noted in a January 2016 article (See: “Japan’s Elite Amphibious Assault Force Trains With US Marines”).